and 20 years of experience help individuals like you put debt behind them. We offer a unique way to get you out of debt. 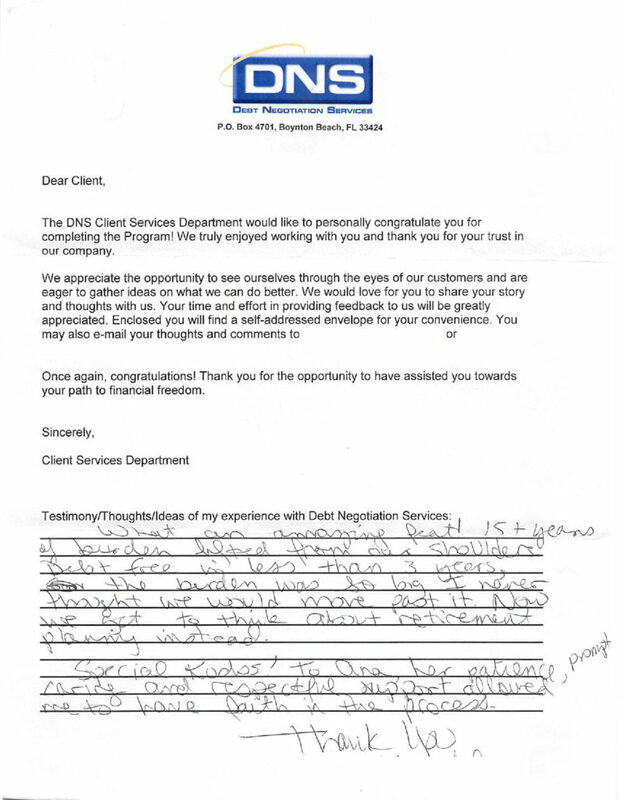 Our dedicated team, advanced technology, and 20 years of experience help individuals like you put debt behind them. We will work with you one-on-one to develop a budget you can live with to get your finances in order. Based on your budget, we can tell you how much you can save and how long it will take you to pay off your debts. Our expert financial advisors will help you start saving money right away to be used for settling your debts. We work hands on with your creditors to negotiate a favorable settlement that you can afford. After many years focused on debt settlement, we have one simple goal – To help people like you with financial struggles create a plan for the future. The main focus at DNS is to get you to do something. Doing nothing about your struggles only leads to regret. Make today a day for change. You have options for getting our of debt…waiting is not one of them. Stop looking over your shoulder, DNS offers a unique Debt Settlement program that will allow you to breathe better and get back on your feet. 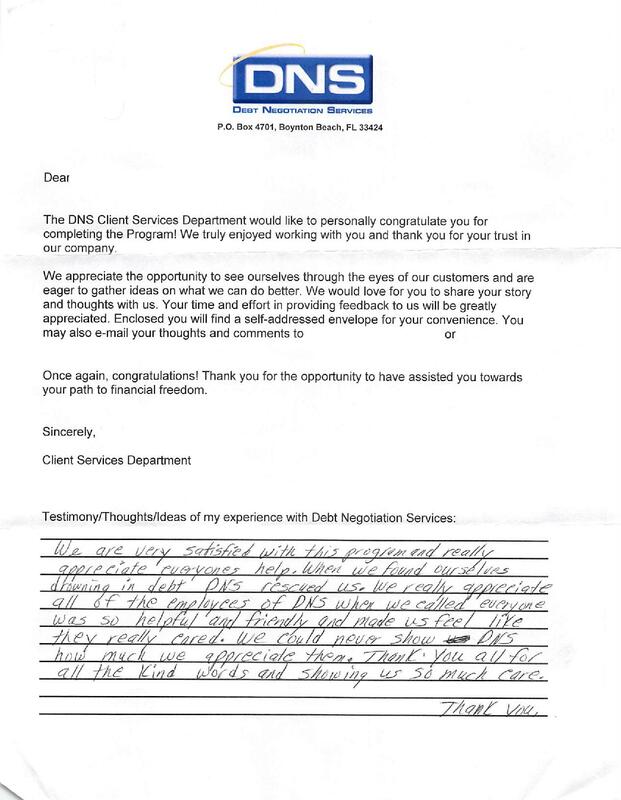 When we quote our clients we give them realistic expectations. We’ve worked with every type of creditor. 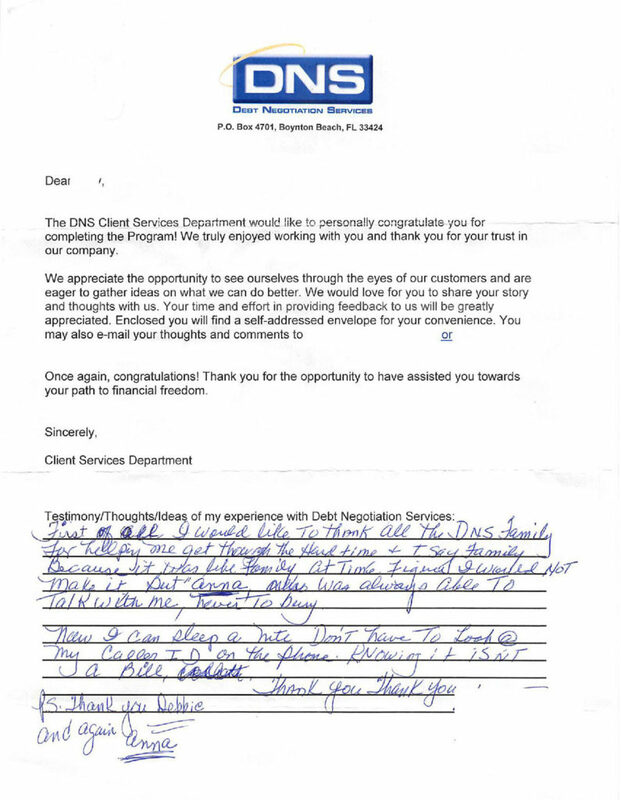 As one of the oldest and most trusted debt settlement companies in the U.S., Debt Negotiation Services has helped tens of thousands of clients regain their financial freedom. What is your debt costing you? When was the last time you were able to go on vacation? Adding up the total of your debt doesn’t tell the whole story! Carrying the burden of debt can cost you more in life than you realize. Remember, you didn’t get yourself into this situation overnight and you’re not going to get out of it overnight! 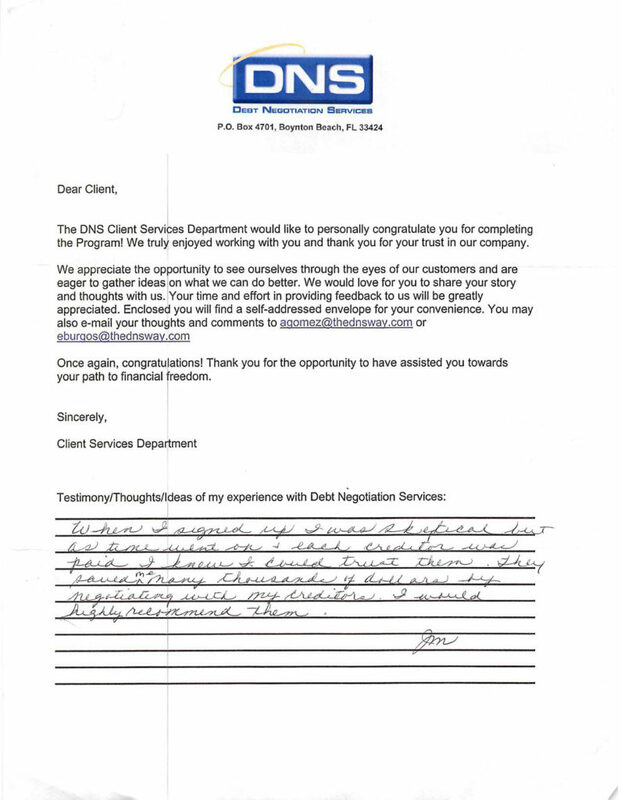 Not all debt settlement clients are able to complete our program for various reasons, including their ability to save sufficient funds. Our estimates are based on prior results, which may not match your results depending on your specific circumstances. We do not guarantee that we will be able to resolve all enrolled debts or that your debts will be resolved for a specific amount or percentage or within a specific period of time. Certain types of debts are not eligible for enrollment into the program, including secured debts, medical debts, and student loans. Some creditors are not eligible for enrollment because they will not negotiate directly with debt settlement companies. 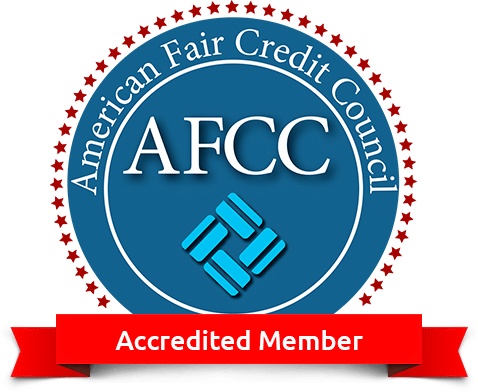 We do not assume your debts, make monthly payments to creditors or provide tax, bankruptcy, accounting or legal advice or credit repair services. Debt Negotiation Services company is; not a lender, creditor, or debt collector. Our service is not available in all states and our fees may vary from state to state. Please contact a tax professional to discuss potential tax consequences of less than full balance debt resolution. Read and understand all program materials prior to enrollment. The use of debt settlement services will likely adversely affect your creditworthiness, may result in you being subject to collections or being sued by creditors or collectors and may increase the outstanding balances of your enrolled accounts due to the accrual of fees and interest. © Debt Negotiation Services. All Rights Reserved.